Purple Heart recipient Marlene Rodriguez is one of only 500 women who have been awarded the Purple Heart. 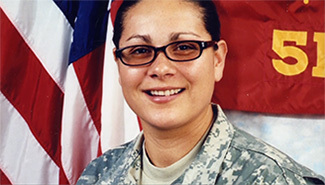 On her third tour to Iraq, she was hit by an IED, sustaining injuries that forced her to retire from the Army in 2009. This wasn’t the first time she was attacked, having survived another IED blast and a firefight on her second tour.